This incident was striking because of my research into myth, philosophy, and beliefs. Myths (stories that explain the world) are not static, but go through a life cycle. Myths can be true or false. They are created initially in the imagination, and then change character as they are refined through experience, reflection, and criticism. Journalistic stories are a form of myth as they explain what is happening in the world. The incident also struck a chord because of a recent conversation I had with a fellow PhD researcher. James Alan Anslow (@AnslowJA, blog, Facebook) has four decades of experience with major news and education institutions as a journalist, editor, and lecturer. For two of those has been researching the relationship between myth and news. His current doctoral research links the archetypal with British tabloid journalism. James said that, as a young reporter, he was taught to go out and “find the story”, as if it pre-existed. And he stressed the word find. He also gave me links to some of his academic papers, in which he argues that ‘finding’ the story is a long established principle in journalism. There is not, and has never been, a place in journalism for the view, usually attributed to Mark Twain, that one should “never let the truth get in the way of a good story”. The actions of The Independent seemed odd, therefore. Although journalism is about ‘finding’ the story, this incident seemed to suggest something else was happening. The story was going through some form of life cycle of development. I therefore decided to do some journalistic digging of my own. I wanted to find what led The Independent to create the first headline. Why did they say Osborne had announced a decision, but then change the story. The first step was to read the full text of Osborne’s speech. There was no mention of cuts, nor any mention of benefits. In fact, the most striking part of the speech for me was his statement – to a group of bankers and financiers – that not enough bankers and financiers had ended up in prison (as a result of their fraudulent manipulation of the markets). 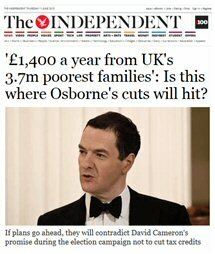 I could see nothing in the speech that even hinted at The Independent’s (first) headline. I therefore returned to the Independent website, to read the story to which the original headline had linked. At the top of that page was an image of George Osborne delivering the Mansion House speech. However, the story did not discuss or refer to his speech at all. So far, I had only dug down one level, from headline to article, but the story had already begun to change. The message of the original headline was that George Osborne had announced a decision in his Mansion House speech. This was untrue – as the text of the speech shows – and a misrepresentation of the story that it linked to. However, that page did claim that the the government were “slashing credits for working families” and provided a hyperlink to another story for more information. Bearing in mind what James had said, I wanted to dig further and ‘find the story’ that was at the bottom of all this. I therefore clicked on this hyperlink to go down to a second level. Surely, in this article, I would find some evidence to support the claim that the government have decided to cut benefits to the poor? Alas, no. I did find some actual evidence, but it was for an entirely different story. This ‘bottom level’ story had nothing to do with the mansion speech, nor even with the policies of the new conservative government. It had been published in February – three months before the election – and was about the competence of an external company used by the HMRC to combat benefit fraud. The company (Concentrix) had been accused of going on “fishing expeditions”. They were sending letters to benefit claimants, accusing them of fraud, and asking them to provide evidence that their claim was bona fide or they would lose benefits. The Independent spoke to staff working at Concentrix and discovered that the company had some significant internal problems. Spotting benefit fraud is very difficult work because of its analytical nature. However, the staff at Concentrix claimed they “haven’t been given enough training to differentiate between genuine claims for tax credits and fraudulent ones”. Also, the staff said they are under pressure to make 20 decisions a day. This means “they often don’t have enough time to review all the relevant data before making a decision”. There was a story to be found, and it was worth reporting. Some Concentrix staff, who are responsible for investigating benefit fraud, are complaining that they have too much pressure, too little time, and too little training to do the job properly. As a result of this, mistakes are being made that are causing distress for valid claimants. They are erroneously receiving letters that accuse them of benefit fraud. However, something happened to this story that transformed it into a completely different and unfounded story. The top-level headline claimed (erroneously) that George Osborne had announced cuts to benefits during his Mansion House speech. Where did that headline come from? This Independent incident seems to have occurred in an overlap between my research and James’. I have been looking at types of myth, the life cycles they go through, and how they relate to truth. James has been showing how Jung’s analytical psychology can be a significant factor (amongst others) in the transformation of a news story. Archetypes can play such a strong role in the formation of a story and in its reading/perception that it sometimes has very little relation to the external facts. For C.G. Jung, everything one believes is a form of mythology. Everything! And that includes science and psychology, as well as religion.1 This is because, as the philosopher of science Karl Popper explains2, even our most scientific beliefs have their origin in the human imagination. We engage in myth-making to explain the world, and then refine our myths through scientific testing. This means that scientific theories are refined myths (i.e. myths that have not yet failed scientific tests). James has been outlining a similar role for the imagination in journalism. The stories that journalists produce as they seek to explain the world have their origin in the human imagination. Archetypes are a fundamental part of both the journalists’ and readers’ imaginations and can therefore influence the creation of news stories and the way in which the reader interprets them. If different archetypes are involved, this can lead to different stories, and different interpretations of them. Sometimes, the shape of the story (or myth, or beliefs) is determined more by the archetypal influences than the available facts. So why did the headline change and then get removed? As I don’t work for The Independent, I can’t be definitive about what has happened. However, from the outside it appears that I observed ‘live’ some journalistic myth-making (i.e. part of the life-cycle of myth). The first version of the story/myth was the product of someone’s imagination. It may have reflected a strong archetypal influence – one that portrays George Osborne and the Conservatives as people who support the rich and oppress the poor. This led to the first story – the first bit of myth-making – which presented Osborne as telling bankers and financiers that he was going to cut benefits for the poor. However, through a Popper-like reflection on the story/myth, and perhaps an editorial intervention, there was a recognition that it did not accord with certain facts. In his speech, Osborne did not mention cuts, or benefits, or the poor, or anything remotely connected. As a result, when someone at The Independent spotted this incongruence, the headline was toned down. But the story was removed quickly thereafter, so there must have been a stage of further reflection. The basis of the story was very flimsy, perhaps even a misinterpretation of previous evidence. There was no evidence to show that the problems were the result of a post-election change in government policy. Rather, the evidence pointed to ongoing problems in the internal management of Concentrix. Jung and Popper both viewed myth as ubiquitous and something that develops over time. We produce myths to explain the world. Then we refine those myths in the light of evidence to produce better myths. And as more evidence comes to light, we continue to improve them. Journalism is a form of myth, i.e. a story or narrative that explains the world. The changes in The Independent’s story illustrate how modern journalistic myths might be formed and then refined. One practical implication for readers is to be wary of newspaper headlines. This means reading the stories underneath to see whether the evidence supports the headline. But there is a more significant implication – that we also have to be wary of our own beliefs. If a belief is shaped by archetypes, then we will be convinced of its truth no matter what. However, if we are self-critical about our beliefs, we will be able to see when the facts and evidence contradict them. We can then change or develop our beliefs so they remain congruent with our experience of the world. In Popper’s view, a belief is only worth holding if it will stand up to one’s own critical reflection and scrutiny, when compared with the available observations and evidence. If we don’t reflect on our beliefs, and don’t allow them to develop and follow their natural life cycle, those beliefs will become obsolete and irrelevant.